Hello beautiful Highlites. I hope you are living high on life, whatever your wishes or dreams are. I'm high on the wonderful weather we have been having the last few days. I think spring is really here. Other than rain, the weather has been amazing. What else am I hgih on? The spring fashion we're finally able to wear. I'm loving the amazing shoes out for the season. The mule is still a fashion statement and one of my favorites, I'm a big time fan, always have and always will. That shoe will never go out of style for me. It's one those effortless shoes — so easy to slide on. And the faux fur sandals will also be around still. Now to this LBD: Little Blue Dress. I'm a lover of all shades of blue. This dress is also easy breezy. I love simple dresses that you can throw on and go when the weather changes to the warmer months. There such a variety of shades and I think blue is a color that will brighten everyone's summer up because everyone looks good in it. You can look fire in all the shades of blue. From cobalt blue, navy blue, sky blue, baby blue and then top it off with your favorite accessories because the look is not complete. 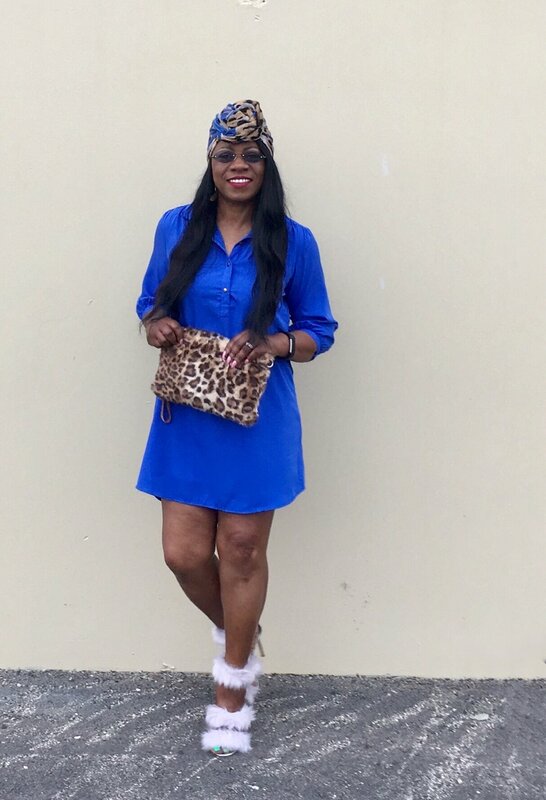 I decided to pair these cute, fun furry three strap sandals in above pictures to complete my look and added a leopard print bag, and a blue and leopard print head wrap around my head for fun not so boring look to the outfit. This cute simple dress is good for date night out to the movies, dinner, or a comedy show. It's a very casual look, and there are also gorgeous blue cocktail dresses, formal dresses or if you are celebrating a special occasion night. Whatever you decide blue is going to be one of the popular colors for the season. So head out to go purchase you something in this beautiful hue. Dress was purchased at Ross Dress For Less, Bag was gifted from a friend, Shoes are by the maker Cape Robbins purchased from Shoe warehouse here in Dallas. Have a good day and Thanks for stopping by, sharing your time.